As the episode begins, George is desperate to remake himself after his emotional scarring at the hands of Meredith. When he's not cutting his own hair, he's working out or jamming on the clarinet (really) with Dr. Burke -- and clearly annoying new roommate Cristina in the process. When Bailey responds to an emergency at the hospital and entrusts Cristina with the care of her newborn, things go from bad to worse for the emotionally devoid Dr. Yang. This combination of maternal instincts and male bonding pushes her to the brink. As usual, Richard is thoroughly confounded by both women. Izzie, meanwhile, falls even harder for Denny. When Alex lets the heart patient know that he and Izzie are an item, neither she nor Denny are pleased. A scolding by Izzie prompts Alex to suggest that she is getting too close to a patient for anyone's good. When Denny suffers yet another heart attack, Dr. Burke suggests implanting a battery-operated device that will help his heart pump until a donor can be received. While it will buy Denny time, he will have to remain in the hospital indefinitely -- an idea he initially rebuffs, but Izzie talks him into, shockingly. On the Shepherd front, Addison is charmed by the husband of one of her patients, who tells her she resembles a young Catherine Deneuve. Even as Addison operates on the man's pregnant wife and save their unborn child, he remains smitten with the talented redhead. 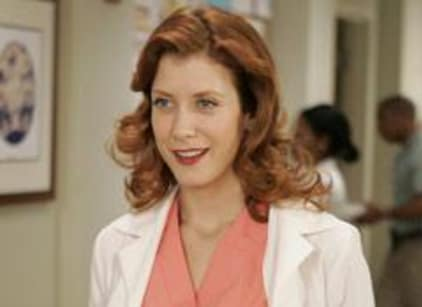 This incurs jealousy from the male Dr. Shepherd, whose budding friendship with Meredith becomes awkward when she confesses sleeping with George. Following a pained reaction, Derek tells her to apologize to George even as he resists her efforts. Eventually, he'll come around, says the dreamy one. Meredith corners George and begs profusely for forgiveness. He walks off the elevator and doesn't look back. Whether he accepts another offer -- of romance -- from Dr. Torres, who is pining for George but miffed at his indecisiveness, remains to be seen. Later, Derek takes his own advice and apologizes to Addison for his absence and indifference to her. Accepting a share of the blame for the near demise of their marriage, he opens himself up to her as never before. As the two come to terms with their arduous relationship, we're left with the feeling of wishing there were more to watch from Seattle Grace, even at 11 p.m. on Sunday.